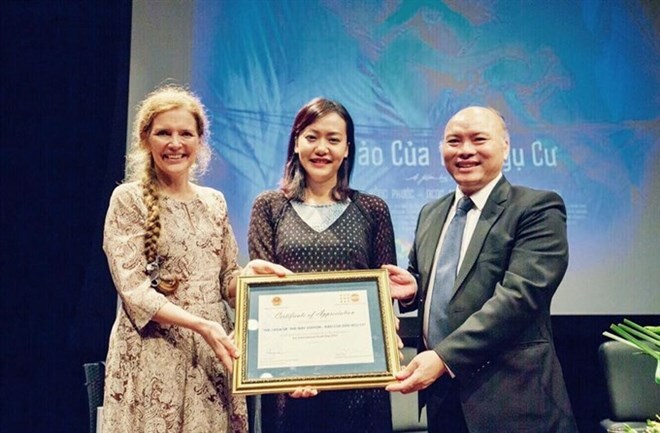 Hanoi (VNA) - The Vietnamese feature film Dao Cua Dan Ngu Cu (The Way Station), directed by established actress Pham Hong Anh, has been awarded the Certificate of Appreciation by United Nations Population Fund (UNFPA), for its contribution to the development of awareness over issues regarding young Vietnamese people. The screening was organised by the Vietnam Ministry of Home Affairs and displayed by UNFPA at French Culture Centre L’Espace to celebrate International Youth Day 2017. Director Anh, who received the certificate, expressed her joy, “On behalf of the cast and crew, I sincerely give my deepest gratitude to the Ministry of Home Affair’s Department of Youth Affairs, especially to Mr Vu Dang Minh, director of the department, and Mrs Astrid Bant, representative of UNFPA in Vietnam for this extraordinary honour. I also would like to thank honoured visitors, international guests who are representatives of embassies in Vietnam, and the young audience who have come and watched The Way Station, as well as discussed and expressed so much affection for it,” said Anh. She also emphasises that the discussions by young people in the seminar after watching the movie has highlighted some of the themes – only by knowing young people can we understand the challenges we see everyday; they have to confront troubles from the past, discrimination, cultural difference, and pressure, prejudice and expectation of their loved ones and society. “Please do treasure and be supportive of the aspirations of young people, their pursuits of freedom and happiness. In the meantime, we also need to assist, give strength, believe and empower them so they have the opportunities to demonstrate their role in building a better, more liberal and happier society and country,” she added.